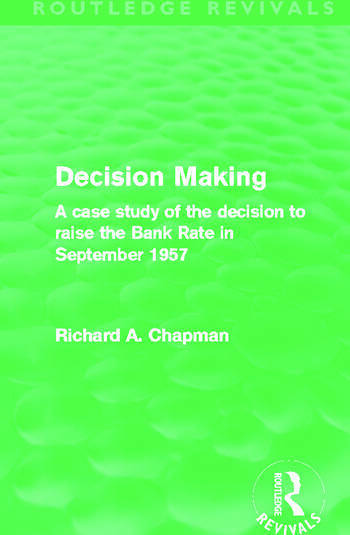 Originally published in 1968, Richard Chapman’s pioneering work illuminates the process of decision making by analysis of a particular example: the decision to raise the Bank Rate in September, 1957. The legal responsibility for a decision may be easy to pinpoint; in this case the Court of Directors of the Bank of England bear this but six weeks of negotiation separate their formal statement from the Chancellor of the Exchequer’s advice to the Treasury to consider effecting ‘a measure of deflation in the economy’. These six weeks of consultation between the Bank and the Treasury proceeding in ‘the pattern of a formal dance’ are analysed and a necessary by-product of this case-study is a closer understanding of how the Treasury and the Bank of England work together. These details are derived mainly from the evidence, and deductions from it, presented to the Bank Rate Tribunal and the Radcliffe Committee on the Working of the Monetary System. Professor Chapman gives his particular findings about decision making a wider application still by forming reasoned hypotheses and informed generalisations about public administration in Britain.